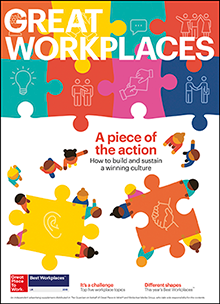 For the fourth year in a row, Baird was recognised as one of the UK’s Best Workplaces by Great Place to Work® Institute UK, a prominent consultancy specialising in employee research and workplace cultures. The firm ranked No. 19 in the Medium category this year. The annual UK Best Workplaces list features organisations with a high-trust, high-engagement workplace culture. Great Place to Work® employs a rigorous methodology in evaluating participating organisations. It includes both an employee survey and an audit of each organisations’ management and HR practices. To be successful, organisations must achieve a high minimum score in the employee survey, which measures trust and engagement levels. Baird is also recognized among the top workplaces in the US. Learn more about the firm’s other best place to work accolades.